As you can see above, assertiveness and cooperativeness are combined to create five different models for responding to conflicts. I offer these as a tool for self-reflection as you review your decision-making process for your non-monogamous relationship. Each of us is capable of using all five conflict-handling modes. And most healthy couples use all five indifferent situations. None of us can be characterized as having a single style of dealing with conflict. But we often use some modes more often than others and, therefore, often default to these when tensions grow. Your conflict behavior in your relationship is a result of your trauma and relationship history and the dynamics between you and your partner. These dynamics are co-created in every relationship. As you read the styles below try to identify situations where you might find each of them useful. Competing is both assertive and uncooperative, meaning one party pursues their concerns at the other person's expense. Often this speaks to a power differential in a relationship. One of you might outrank the other in authority, expertise, history or some sort of resource and therefore hold more power. Competing means "standing up for your rights," defending a position which you believe is correct, or simply trying to win. Competing can work in situations where the power differential is clear and consensual. However, for most negotiations in non-monogamy, competing does not allow enough room for empathy and care to maintain the connection between you long-term. Accommodating is listed as both unassertive and cooperative (notice it's opposite of competing). When accommodating, the one person neglects their own concerns to satisfy the concerns of another. There can often be an element of self-sacrifice in this mode. In healthy dynamics accommodating can be a form of generosity or service or yielding when the issue feels unimportant. Dan Savage often refers to these issues as the "price of admission" meaning something annoying you can put up with as part of being in a relationship with this specific person. When considering non-monogamy accommodation frequently leads to resentment-building and martyrdom. Too often we over-compromise and regret it later. Avoiding is both unassertive and uncooperative- parties neither pursue their own desires nor their partners'. Nobody has to deal with the conflict. Usually, in the case of open relationships either nothing happens, affairs occur, of couples try to enact an "don't ask don't tell" policy. In the best cases, avoiding takes the form of diplomatically sidestepping an issue, postponing it until a better time, or withdrawing when safety is a concern. However, in non-monogamy often avoidance creates and maintains a distance between partners. Because we don't talk about things (DADT and affairs or unethical/non-consensual non-monogamy) we miss many opportunities to connect and start missing each other along the way. Compromising is where most healthy open couples start out, it's mild in both assertive and cooperative measures. The objective in compromise is to find some expedient, mutually acceptable solution that partially satisfies both parties. Compromising requires both partners give up more than if they were competing but less than when accommodating. It also addresses the issue more directly than avoiding but doesn't get as deep as collaborating. I see this in open relationships when folks split the difference between the two opposing positions, by mutually exchanging concessions, and seeking a middle-ground solution. This can work for short-term agreements when nonmonogamy is really new and couples are regularly checking in for connection and to rethink their communication process as needed. It works if both parties are willing to enter openness slowly and with care, knowing new compromises and changes are potentially on the horizon. Collaborating is both assertive and cooperative—the complete opposite of avoiding. Collaborating means both parties work together to find some solution that fully satisfies their concerns. It usually requires digging deeper into the issue to identify underlying needs and wants of both partners. The folks who most successful maintain connected relationships in non-monogamy typically practice a form of collaboration. Collaborating requires an openness to take the other parties perspective, genuine empathy for the experience of the other person, and a real willingness to stay patient, curious and creative. 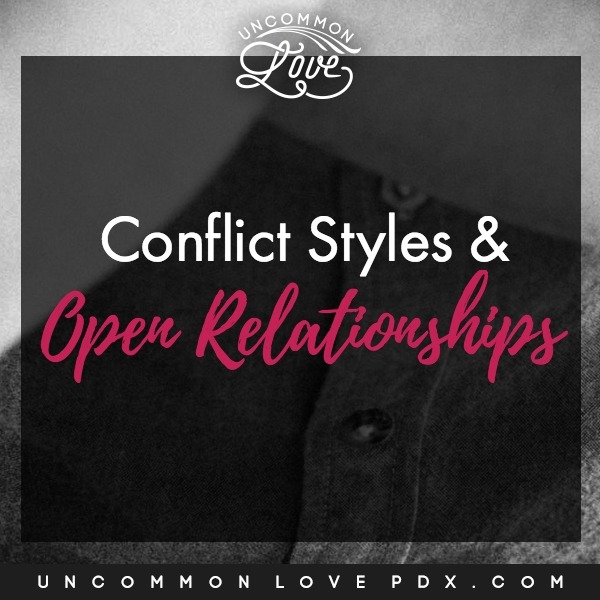 If you want help navigating conflict with connection and compassion as you open your relationship I'd love to talk with you. Give me a call.